Chef Henry Presents . . . Some nights when I'm just drfiting off, I find myself back in the tiny two-family house where I grew up in Fair Lawn, New Jersey. My maternal grandparents share the upstairs apartment with my grandmother's own mother and father. My parents, big brother and I occupy the flat below. When the dream is going really well, I can actually smell Grandma Sadie's sweet-and-sour cabbage soup. My grandmother, Sadie Popkins, dedicated her life to satisfying the physical and emotional needs of all four needy generations. Her matriarchal mandate ranged from arbitrating the nightly pinochle game that always ended with cards and curses flying through the air, to ensuring that Singer the Seltzer Man’s weekly deliveries of the life-sustaining elixir flowed copiously and without interruption. But her deepest devotion was to her two corpulent grandsons, Michael and Henry. And to ensuring that in this safe, post-World War II, pre-Korea world, we would not have to wait till we were forty to have our first heart attacks. Accordingly, she schlepped home our combined weight in groceries every day. Carl the Butcher stamped our initials in blue ink on the most heavily marbled sides of beef. Three bakeries operated around the clock to keep pace with our ever-escalating carbohydrate requirements. The Atlantic and Pacific Tea Company named frigates after each of us (mine was bigger). An endless procession of birds and beasts were offered up on her four-burner Kenmore altar. Beethoven said “Only the pure in heart can make a good soup.” If soup is served in heaven, Grandma Sadie must surely be God’s personal potagér. For grandmothers and cordons bleus, the stockpot is a virtual playground. But for the beginning cook, it is an unequalled educational opportunity. The leisurely magic by which it transmutes odd meat relics, flinty old bones and woody vegetable scraps into liquid gold seems more akin to alchemy than gastronomy. So take off your toque blanche, put on your wizard's hat, and let’s bone up on stock. To make serious soup, you will need a stockpot of serious size. These are made in a bewildering choice of materials: plain cast iron; enameled cast iron; aluminum, both sheet and cast, plain and anodized; stainless steel; copper; and earthenware. Plain cast iron has many advantages. It can be purchased from any department or hardware store at modest cost; it distributes and retains heat superbly; and it’s indestructible. However, its weight makes sizes in excess of seven and one-half quarts (Lodge’s largest dutch oven) impractical for most modern non-hunter-gatherers. Before cast iron cookware can be used for the first time, it must be seasoned–heated and rubbed with oil repeatedly with the object of eventually creating a non-stick, rust-resisting surface of polymerized fat. But unless carefully dried after each use, cast iron will rust. Enameled cast iron neither rusts nor discolors food. But unless handled with great care, the enamel is guaranteed to chip around the utensil's edges, and become unsightly. The use of metal utensils will damage the interior, and scouring powder will permanently ruin the glaze, causing food to stick and burn. Le Crueset, imported from France and distributed through department stores, is the best-known example of this type of cookware, and is quite expensive. The sheet metal aluminum stock pot is the mainstay of the restaurant industry, and with good reason. Cheap, lightweight and durable, it needs no seasoning and is immune to rust. The pitting and darkening that may eventually occur does not impair its usefulness. Cast aluminum cookware, epitomized by Magnalite, distributes heat about as well as cast iron, and is equally durable. Though not cheap, it requires minimal maintenance, and will keep its looks and performance forever. Like cast iron and carbon (non-stainless) steel, aluminum can sometimes react with acids and discolor foods. Anodized aluminum, however, recognizable by its charcoal-gray interior, has been heat-treated to render it non-reactive. The best-know example is Caphalon. Thought not cast, it’s stamped from heavy-gauge aluminum, and is quite expensive. Magnalite's fine cast-aluminum cookware is now available with anodized interiors. A rumor linking aluminum cookware to an increased incidence of Alzheimer’s Disease has been in circulation for more than forty years. But the quantity of this third-most abundant element on earth (after oxygen and silicon) entering our bodies through the use of cookware is insignificant compared to the levels of aluminum we ingest from leafy green vegetables, not to mention from prescription and over-the-counter drugs, processed foods, underarm deodorants, and antacid tablets. Stainless steel is easy to keep shiny, but it’s a miserable heat conductor. Manufacturers such as Revere and Farber solved this problem in the 1930s by bonding copper and aluminum bottoms to light, easily cleaned stainless steel bodies. Generations of excellent home cooks built their reputations using pots and pans of this type. Manufacturers such as Cuisinart and All-Clad offer cookware of similar design and quality at much higher prices. Perhaps you have your cap set for copper. My own mismatched batterie de cuisine includes a fair number of copper pots and pans, culminating in a colossus called a casserole russe, salvaged from the old Waldorf Astoria kitchens. Copper is mildly toxic, so copper pots must be lined with tin or stainless steel. (The exceptions are pots are used for cooking sugar, and bowls used for beating egg whites.) All tin-lined copper pots will eventually require relining. Only a handful of companies still provide this service, and the cost is so high that it is impossible to justify on practical grounds. For this reason, most of my copper pots have been decommissioned for kitchen use, and now serve as decorative objects. Copper pots lined with stainless steel are not subject to this kind of wear, and will last indefinitely. They are, however, extremely expensive. Nonstick coatings may be alright for cheap, disposable cookware. When it soon scratches, flakes or wears off, they can be tossed without a backward glance. But when nonstick coatings are applied to otherwise high quality, heavyweight cookware, they become as impermanent as a cheap, disposable pan. Pot-au-feu, France’s most famous soup and arguably her most famous dish, is often called petite marmite after the pot in which it is cooked. A marmite may be made out of any of the previously discussed materials, but traditionalists prefer earthenware. Large earthenware marmites from France are the stuff of fancy gift catalogs, and extremely expensive. But the Chinese, who typically place two or sometimes three different soups on the table to be consumed throughout a meal, make them and other long-simmered dishes in earthenware vessels called sand pots. These come in a wide variety of sizes and styles, all of them glazed on the inside, some reinforced on the outside with heavy wire. By observing three simple rules, a sand pot can last indefiitely: soak it in water overnight before using it for the first time; do not place it empty over high heat; and do not drop it on the floor to see if it will bounce. Some styles have remained unchanged for a thousand years, and are true objects d’arts. They perform superbly, and are available at low cost from well-provisioned Chinese grocery stores. Because the least costly cuts of beef, chicken, fish, lamb, pork and veal contain the highest ratio of connective tissue to lean meat, they make the best broths. When the collagen in the connective tissue is placed in water and subjected to heat, it is converted by the process of hydrolysis to gelatin, which gives a well-made stock its characteristic lip-smacking succulence. To convert all the collagen to gelatin may require twelve or more hours of simmering, though once underway, no further intervention is required. The only way to speed up hydrolysis is by increasing the temperature of the water to beyond 212-degrees F. And the only means by which this is possible is with a pressure cooker, which shortens cooking times to a fraction of that obtainable by other methods. Large models, which may also be used for canning, double admirably as stockpots. Look for the All American brand by the Wisconsin Aluminum Foundry. I found my own fifteen-and a-half-quart Number 7 at a thrift shop many years ago. I was able to determine through the Company that it was made in the 1940s. Except for the current Model 915's mirror finish, it is virtually identical to my seventy-odd year old Model 7, right down to the pressure gauge, relief valve, and smallest rivet. Examples as old and older than my own have been in continuous service preparing meals and preserving meats, fruits, and vegetables on family farms across the United States. All stocks are started in cold, salted water. Plunging meat, fish or fowl into hot water seals the surface much like a hot pan, hot fat, an open flame, or a preheated oven does. Salting draws juices from the interior to the surface, which is why many cooks frown upon salting meat prior to broiling or frying. When making stock, however, the object is not to seal these essences in, but to extract and dissolve them. It’s an axiom of the kitchen that salt can always be added, but that once a dish has been over-seasoned, it’s the chef who is cooked. If in your exuberance you should add too much salt to a stock, soup, stew, sauce or other simmered dish, there are two ways to pull your fat out of the fire. A raw starch, such as potatoes, rice or pasta, may be added to the pot, though this will cloud a clear soup. Or rinse a kitchen towel or doubled-up length of cheesecloth in cold water, and wring it dry. Stretch this across the top of the pot, cover tightly, and taking care that the cloth doesn’t sag into the liquid or get too close to the flame, simmer. Much of the excess salt will rise in the steam and condense in the cloth, which may afterwards be washed, dried, and reused. And speaking of pulling your fat out of the fire, you will want to remove as much of it as possible from your soup. Though many a heartsick gourmand has rhapsodized momma’s chicken soup, its surface glistening with golden circles of fat (which in my own fat family circle were referred to as “eyes”), modern nutritional theory inveighs (not to say oy veys) against it. Allow your soup to chill overnight in the refrigerator. Then all the fat, which will have solidified on the surface, can be easily removed. If you can’t wait overnight, tilt the pot, and suction out as much fat as you can with a turkey baster. Clear soup (also called stock, broth, and consommé) may be frozen in ice cube trays. Then you pop the cubes out into a plastic bag, use what you need to enrich soups, stews and sauces, and return the remainder to the freezer. Soup is the ideal medium for growing bacteria. If left unrefrigerated for more than six hours, it should be brought to a boil, and simmered for at least twenty minutes. The following is excerpted from Horace Kephart’s turn of the century masterpiece, “Camping and Woodcraft.” It underscores the ancient principle that the good things that go into the stockpot are restricted only by sound judgement, and never by a written recipe. Such judgement can only be acquired through reading, observation, and cooking. Towards this end, the stockpot is a kind, forgiving, and inspirational teacher. The best thing in a fixed camp is the stock-pot. macaroni, stale bread, everything edible except fat. (skilligalee) simmering for all hours. 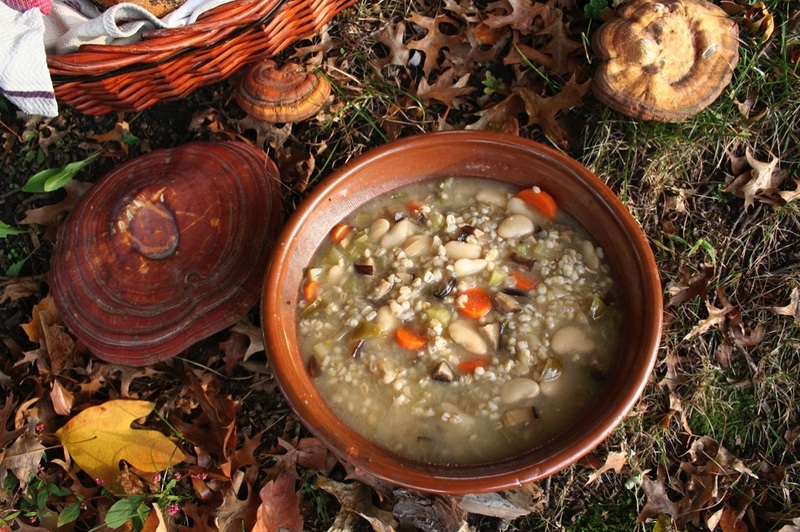 Pot-au-feu (pot on the fire), the national dish of France, is a domesticated version of Kephart’s skilly. Variations will differ in ways that reflect the region, season, and individuality of the cook. The French have no corner on the concept, either. Spaniards dote on their olla podrida (literal translation, putrid pot), while the Swiss bank on their soup aux fides. In the north of Italy, restaurants rise and fall on their bollito misto–and that’s no Bologna. 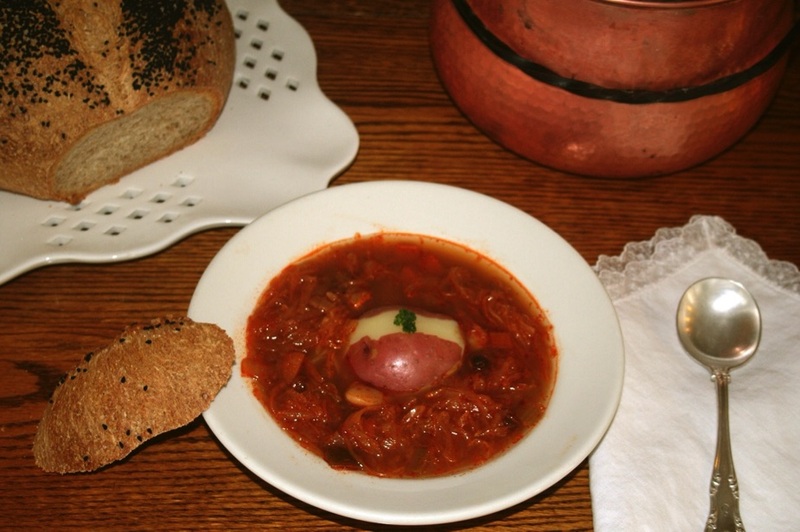 Hungarians steal home to a bowl of hovesy maso. In Belgium, the soup of an evening is apt to be hotchpot. Scots seek succor in a steaming hotch-potch–liguistically, just a hop, skip and a jump from our own hodgepodge, meaning a jumble, medley, or confused mixture. The following recipe, then, is generic, lacking, for example, the dried cantaloupe skin not uncommonly included in the stockpots of Provence! Place the meat and bones in a large stockpot with the water and salt. Bring to a boil over high heat, skimming the foam that rises to the surface. Add a pint of cold water, continuing to skim as you bring the pot to a second boil. Reduce the heat, cover loosely, and simmer undisturbed for one hour. Use the cloves (Dutch for nails) to secure the bay leaves to one of the onions. Add the remainder of the ingredients, partially cover, and simmer an additional three or more hours. Carefully lift the meat and bones from the pot. Put the meat in a dish along with any bones that still have their marrow. Moisten with some broth, cover, and place in a slow oven to stay warm. Gingerly remove the vegetables, snipping and discarding their strings. Skim most of the fat from the surface of the broth. Line a tureen with slices of stale or oven-toasted bread. Strain the soup over the bread, garnish with some of the vegetables cut up small, sprinkle with fresh chopped parsley, and serve as the first course. Slice the meat and arrange on a serving platter along with any marrow bones, and surround with the vegetables. Serve this as the second course, accompanied by small bowls of kosher or sea salt, fresh black pepper, mustard, horseradish, pickles, and potatoes that you have boiled separately. Arrange the meat in a large stockpot. Add the remainder of the ingredients, reserving the potatoes. Don’t be overwhelmed by the amount of cabbage–as it cooks, it will reduce to one-third of its original volume. Bring to a boil, reduce the heat, and simmer, partially covered, for two hours. Add the potatoes, and simmer an additional 45 minutes to an hour. Taste and adjust the lemon juice or sour salt, sugar, salt and pepper. Serve the soup, meat and potatoes together, or the soup first, followed by the meat and potatoes. Be sure to have plenty of rye bread for dunking and mopping up. *Sour salt, also known as citric acid, is available in the kosher aisle of your supermarket, or from your pharmacy. It was used in Eastern Europe, where lemons were out of reach to all but the wealthiest families. Here in America, where lemons seem to grow on trees, many cooks continue to use sour salt in cabbage soup and stuffed cabbage. use, add it by pinches, tasting as you go.